Overcoats were an essential item of clothing for the Victorian gentleman; his clothing being a reflection of his social standing and status. Overcoats were worn outdoors or while travelling, so it was important that they were warm and comfortable. During this era, a number of new and long-lived styles were introduced, such as the Chesterfield or the Inverness. For the first time overcoats were available in a range of materials - from velvet to wool. 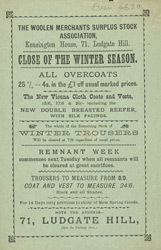 An expensive item of clothing at the beginning of the Victorian period, the price of overcoats came down and their popularity increased with the advent of mass production.